Police radar units can be verified for accuracy by utilizing a "tuning fork". The radar is not actually "tuned" but simply verified as being accurate by the use of the tuning fork. The word "tuning" comes from the fact that the same type of forks are used to "tune" musical instruments. The tuning fork is made out of aluminum, and it's length and shape is designed to vibrate at a set frequency each time it is struck. Any X band tuning fork will work on any X band radar. Any K band fork will work on any K band radar. Ka band forks are specific to the manufacturer of radar. This is because all 4 manufacturers have different Ka band operating frequencies. The tuning forks are used as an "external source" of generating a signal and thus verifying the accuracy of the radar's readout. Again, no actual tuning or adjustment is done on the radar. One tuning fork is required for a stationary only radar. Two tuning forks are required for a Moving/Stationary radar unit. 1) Place the radar in stationary mode of operation. 2) Place the range control in maximum position. Place the antenna in the transmit mode by releasing the "hold" switch or putting the radar unit in "run". 3) Lightly strike the lower speed fork on a hard non-metallic surface and hold the tuning fork approximately 1 inch in front of the antenna. With a dual antenna radar, either antenna may be used. 4) Verify that the target speed displays the same as the speed stamped on the tuning fork +/- 1 mph. 5) Repeat steps 3 and 4 using the higher speed tuning fork. 6) Place the radar in moving mode of operation. 7) Using the lower speed fork, perform step 3 and verify that the patrol speed displays the same as the speed stamped on the tuning fork +/- 1 mph. 8) While continuing to hold the lower speed fork in front of the radar, perform step 3 on the higher speed fork and hold it in front of the radar as well. X band are for older model radars usually antenna or radar is marked 10.525 Ghz. Ka band radars include: Genesis 2 models with antennas marked Ka band or 35.5 Ghz, Kustom Eagle series radars with 35.5 Ghz (or 33.4-36.0 Ghz) frequency marked on side. Kustom Talon. MPH Python series 1, 2, or 3 or Fs marked Ka Band between antenna connectors. MPH Bee with counter unit marked Ka band. Stalker Dual with antennas marked 34.7 Ghz. 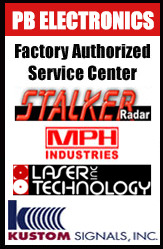 All Stalker DSR or DSR 2x radars. Stalker ATR or Stalker 2 handheld units.